Stainless steel water bottles have become a common sight these days - much to the joy of those of us who care about the environment, since reusable bottles save plastic, petroleum, and encourage better consumption habits. Because they are everywhere these days, however, the humble stainless steel water bottle is starting to take on a patina of ubiquity / disposability similar to its green product forebearer, the "eco tote" - and this is not a good thing. In order for people to treasure and take good care of their possessions, they need to form an emotional attachment to them - which means an object needs to feel special and unique to its owner. Just when I thought that the practical-but-ubiquitous stainless steel water bottle was perhaps starting to go the route of the eco tote (i.e. stuffed in the closet or collecting dust on the shelf), I discovered Wawabots customized water bottles! 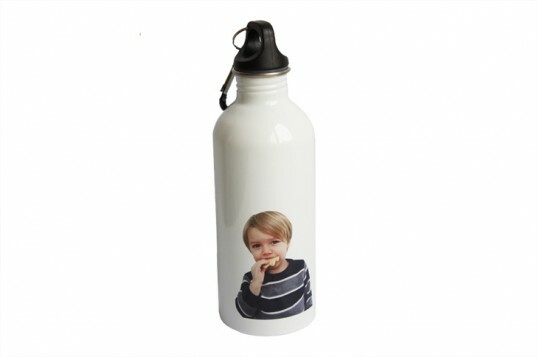 Wawabots is a new company that allows a buyer to customize their stainless steel water bottle with a photo of their near-and-dear or a personal graphic. 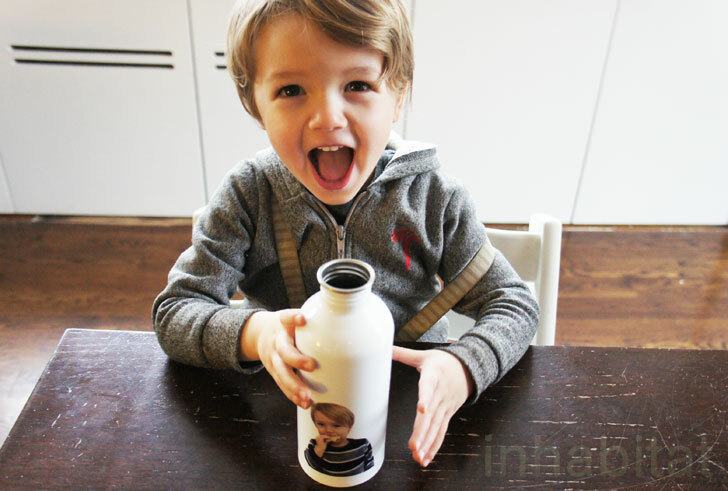 I was thrilled to discover Wawabots, because it came at the perfect time for me – right after my 3 year old son had just lost his last water bottle. He needed a new one, and I figured that he might take better care of a bottle with his face on it. Not to mention it’s a lot harder to ‘misplace’ a bottle with a giant photo of a specific person’s face than a generic bottle. So I uploaded a design to the Wawabots website, and within a week, my Petey bottle arrived in the mail! Petey was so thrilled to see his special custom bottle, that I think he’s never going to let his hands off it. 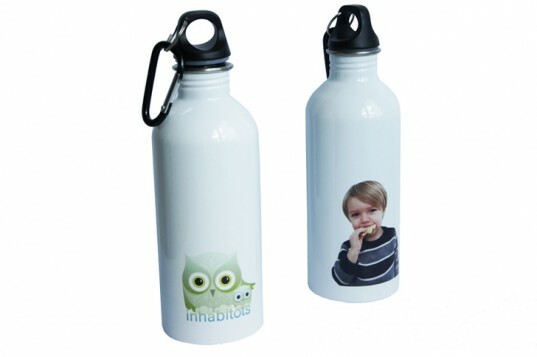 I also ordered a bottle with the Inhabitots Owly mascot, Habby, on it – and both bottles look great. Wawabots clearly does as good of a job with photos as they do with vector graphics, and I will definitely be ordering more of these to give as gifts. The bottles are made from 100% stainless steel – no aluminum, no suspicious linings with BPA in them. Wawabots bottles make it fun to carry around a canteen, and provide a healthier, environmentally-friendly alternative to bottled water and packaged juice drinks. They’re fun for kids, and a good way to kick the sugary juice habit. Wawabots is offering Inhabitots readers an extra special holiday deal on Wawabots bottles through the beginning of January 2012! Use this coupon code – INHABITOTS – with your purchase and receive 35% off plus free shipping on your order. This stellar deal expires on 1/2/2012, so get your personalized Wawabots bottle printed while this offer lasts. This is such a fun idea. So many ways to personalize your kids' water bottle! Looks like a great way to help your kids keep track of their stuff. It's like writing their initials on their shirt tags but better. These look like they'd make fantastic gifts - and they're a subtle way to get bottled water drinking friends to switch to reusable bottles! I would love to take a picture of my kids hugging a tree and putting on my new green wawabot! We do not have money this year for one single gift. I would like to win one for my husband to carry to work. He dreams of building a sail boat, so I would put a pic of a sail boat on his water bottle! I was thrilled to discover Wawabots, because it came at the perfect time for me - right after my 3 year old son had just lost his last water bottle. He needed a new one, and I figured that he might take better care of a bottle with his face on it. Not to mention it's a lot harder to 'misplace' a bottle with a giant photo of a specific person's face than a generic bottle. So I uploaded a design to the Wawabots website, and within a week, my Petey bottle arrived in the mail! Petey was so thrilled to see his special custom bottle, that I think he's never going to let his hands off it. 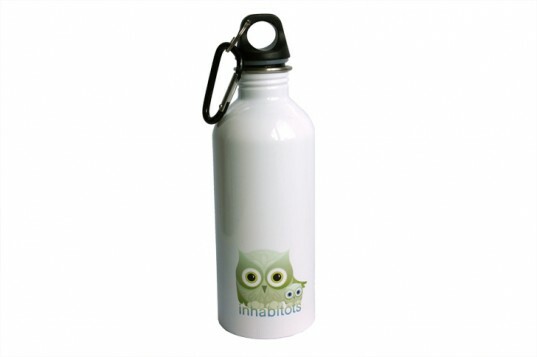 I also ordered a bottle with the Inhabitots Owly mascot, Habby, on it - and both bottles look great. Wawabots clearly does as good of a job with photos as they do with vector graphics, and I will definitely be ordering more of these to give as gifts. The bottles are made from 100% stainless steel - no aluminum, no suspicious linings with BPA in them. Wawabots bottles make it fun to carry around a canteen, and provide a healthier, environmentally-friendly alternative to bottled water and packaged juice drinks. They're fun for kids, and a good way to kick the sugary juice habit.